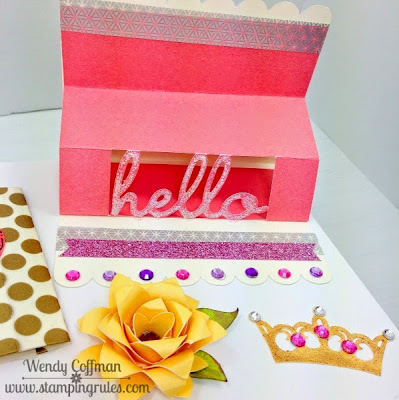 Welcome to this month's Stamp of the Month blog hop. 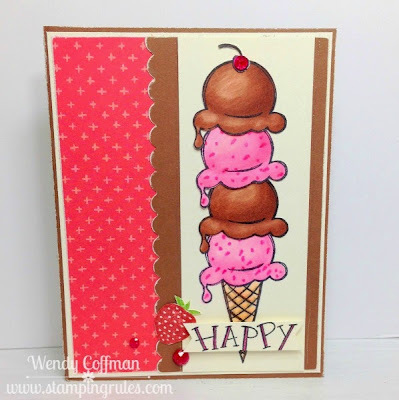 We have over 50 consultants sharing fun creations with the June Stamp of the Month, Ice Cream Dream, a set of 7 luscious treat stamps. 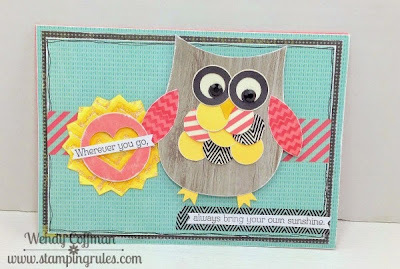 You might be arriving here from SHEILA'S BLOG- let's hop! I've been on a card making kick for a while, so it felt really good to scrap again. I was inspired by the May Sketch over at My Creative Sketches. I had this really cute Instagram shot of the boys enjoying a little treat when the warm weather hit. 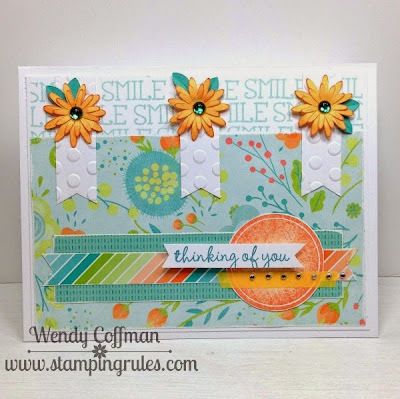 I stamped the big sentiment around the edges of a sheet of White Daisy cardstock using Cashmere ink. Then I layered on some Blossom papers and stitched around the edges. I stamped some of the treats onto White Daisy cardstock and colored them using my Shin-Han markers. After I blended the coloring I added some clear Wink of Stella and stardust glitter gel. I fussy cut and mounted them onto foam tape. I stamped some Doodled Designs down before adding the treats and a few Chalk It Up puffy stickers. I stamped most of the title directly onto the layout using the Hopscotch alphabet. Then I stamped and fussy cut a couple of the important works on Sunset Cardstock. 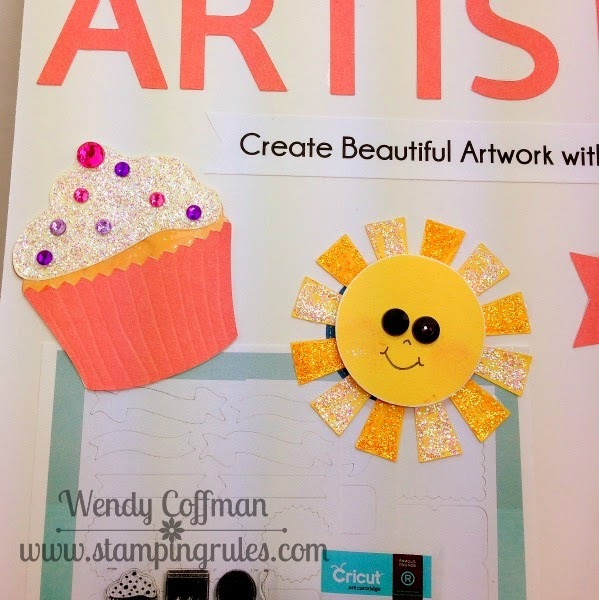 I glittered them with clear Wink of Stella and adhered them to the page with Bonding Memories. You can grab your own Ice Cream Dream until the end of June by asking your consultant or clicking here. Next up is CAT'S BLOG - have fun! Since tomorrow is the last day of May it's also the last day to get the Taste of Summer stamp set. So I figured it deserves one last project, right? 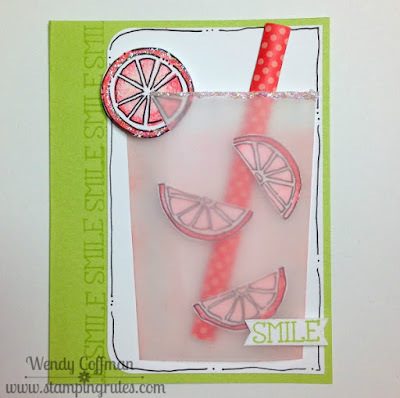 I was inspired by the Color Throwdown #344 - the colors of Pink Lemonade! I started with the new sketch from RetroSketches. I cut a card base from Sweet Leaf cardstock. I made a large vellum cup with the flaps like I did for my other lemonade cup to fill the open white area and sponged it pink for the lemonade. I cut them 1/2" wider than I need them to be, then score at an angle down each side to make the flaps. Then I adhere the inside pieces down before gluing the flaps to the card, slightly rounding the vellum like a cup. Inside the cup this time I added half wedges of pink lemons and a dotted paper straw I built out of a 5/8" strip of paper that I curved over a paper piercing tool and popped up with foam tape. I slit the full slice of lemon and slid it onto the edge of the cup. 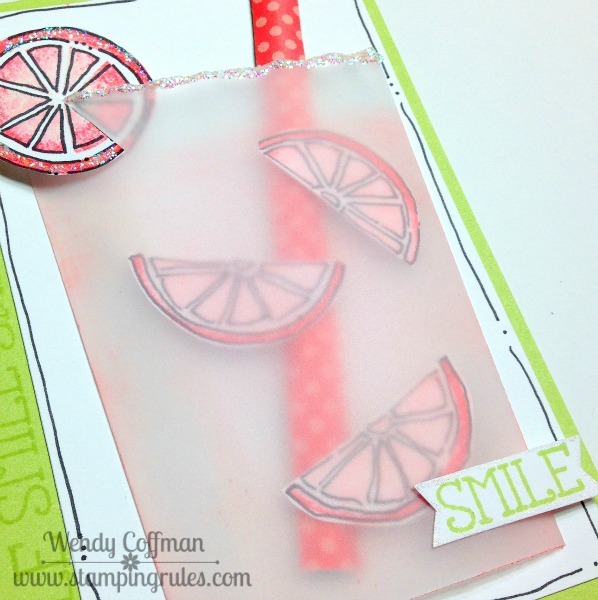 I outlined my lemons with a fine tipped black pen after seeing this card by Karen Pederson. A little "sugar" in the form of glitter gel and I was ready to smile. Thanks for stoppin' by! Tonight I made a card using the new CAS(E) This Sketch Challenge #125. I love the sentiments in the Operation Smile stamp set Happy Everything, so that's the sentiment I chose to highlight. I embossed some Colonial White cardstock with a Dot embossing folder. I cut a 2 inch strip of Blossom patterned paper. I placed black chevron washi tape across the center, and used post-its to mask off the washi area while I stamped the sentiment pieces and arrow border. I trimmed a 1/2" strip of teal glitter paper and adhered that across the washi tape. I popped up three black cardstock cricut hearts with foam tape and gave them a washi of black Wink of Stella. 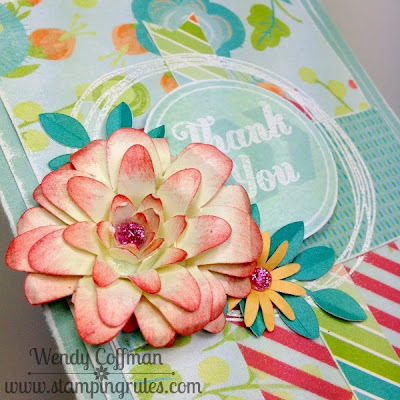 I trimmed the blossom paper close along the edges of the sentiment and mounted it onto the embossed card front. Then I added a row of bitty sparkles along the bottom of the glitter paper. Happy everything! 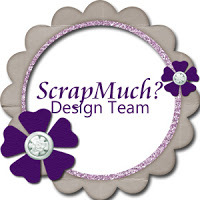 Welcome to this month's Scrappin' Our Stash blog hop, where the challenge is to make something using only items from your craft stash. 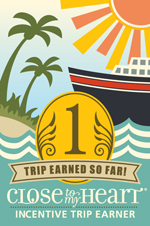 You might be lucky enough to be arriving here from CHERYL'S BLOG. If not, keep on hopping and you'll come back around to check out her awesome project! If you're a fan of this hop, you've seen me working on this series of Hoop Art for almost a year now, adding a hoop almost every month. This month I made this mini hoop, a 3" baby hoop, filled with a scrap of Grey and silver polka dot fabric from some unfinished project that I can't even remember now. I added some washi tape covered banner diecuts along with a few flowers left over from my Heirloom Pro stamp show demo. I have trouble stopping when I craft. I feel like there's always another detail I could fix or add, something I could redo or make better. So I've wanted to hoop this sentiment for a while. I stamped the letters in Memento Tuxedo black, then went over them with Liquid Glass to make them more 3-D. In the spirit of the sentiment, I hand lettered the rest of the words. It's not a perfect hoop, but it makes me smile. I need this reminder daily, because if I've learned anything from doing this 365 days of blogging challenge, it's that it is the process of creating that fills that spot in my soul and makes me happy. Now hoop on over to KRISTY'S BLOG to see more stash bustin' goodness. so I hopped over to CAS on Sunday where they are having a Tic Tac Toe challenge. I chose the center row: Butterfly, Male/Female, and Stitching. 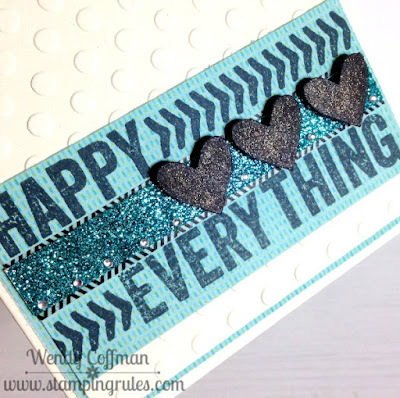 I stamped the sentiment from Happy Everything in black ink. Then I stitched around the sentiment twice using two strands of white thread. 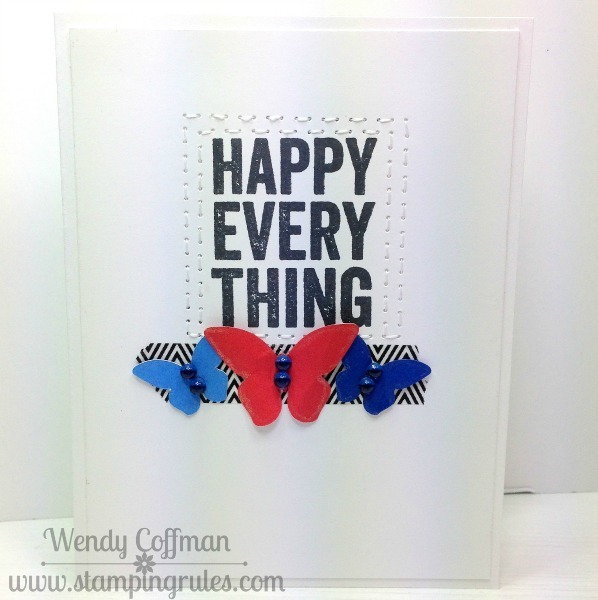 I added a strip of black chevron washi tape and mounted three butterflies onto the tape base. I chose Red and blue, because Paper Issues is doing a Red, White, and Blue party right now, and I thought it was good for the male/female part of the tic tac toe challenge. 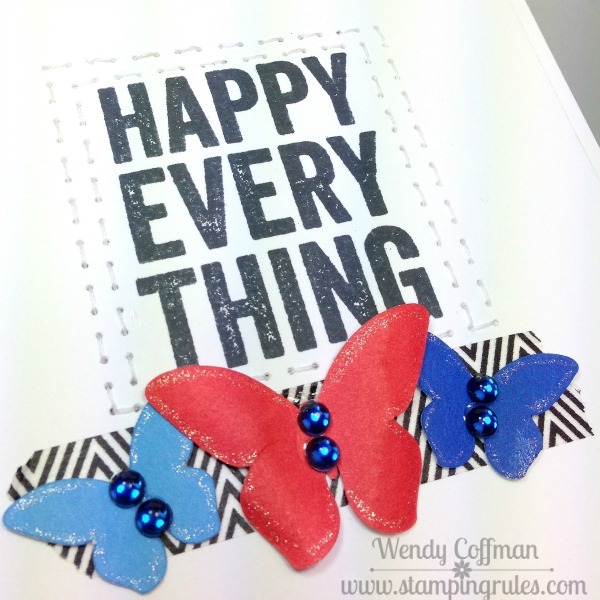 I added just a hint of Wink of Stella on the edges of the butterflies and a few blue epoxy bubbles to the bodies. I can't seem to stay away from the June SOTM. I know it's not available until next month, but it's just so cute, and I love the big sentiment. 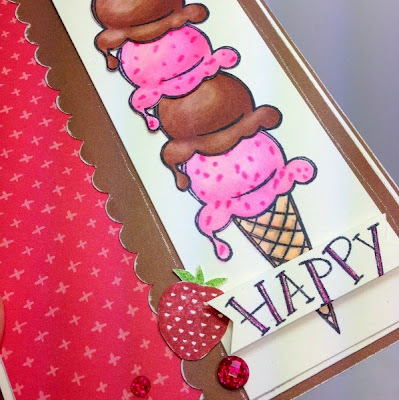 I peek over at the new MUSE Card club challenge and immediately wanted to do the card over into an ice cream card. I lined a panel with Gold Dot washi tape. 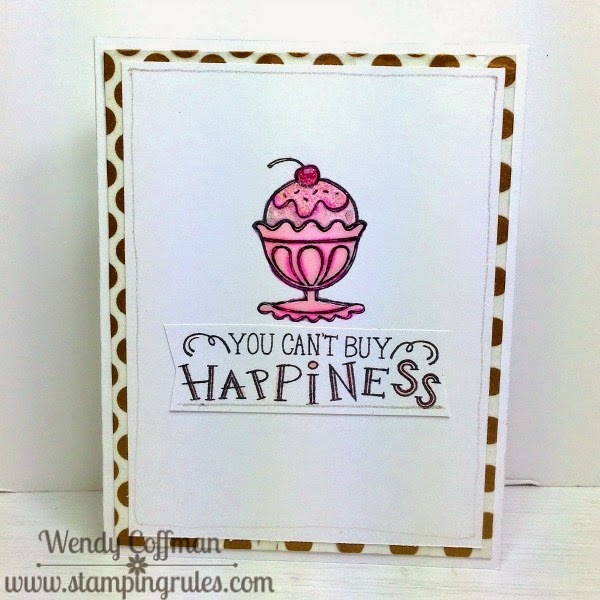 I stamped the sundae in Memento Tuxedo Black on another panel, and colored it with two Spectrum Noir markers (PP!, BP2) plus the blender. Then I added Liquid Glass to the dish so it's nice and shiny and glitter to the sprinkle topping because, well, glitter. I topped that cherry off with a glitter gem. 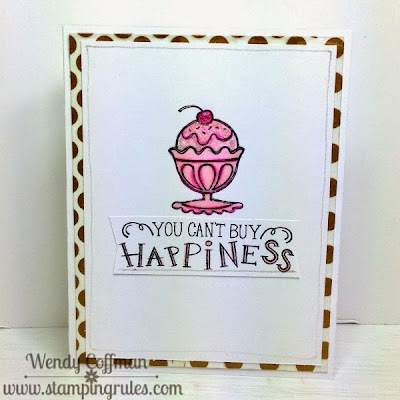 I tried stamping the sentiment right on the card like the MUSE did, because her card was so simply adorable. But I couldn't do it. So I added it to a banner...and glittered the edges of the letters...and underlined happiness with a glitter gel pen. Just keepin' it simple over here. On the inside I added a panel of the Gold Dot washi tape under my sentiment panel. I colored parts of the sentiment with the same markers, then hit them up with a bit of clear Wink of Stella. Then I had to go have some ice cream. 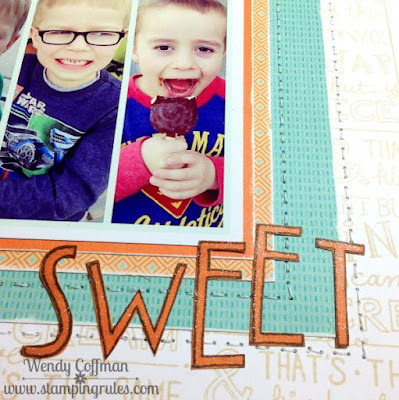 Maybe that's why I like stamping with this set so much - the power of suggestion! So I know I've been on kind of a Blossom kick lately, but I just can't seem to get enough of this print! Today I looked at the new Mojo Monday sketch and I just had to make one more Blossom card. 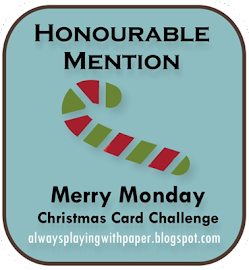 It's Tall and Skinny week over at Mojo, so this is a 3.5 x 5.5 card. I used Smoothie stripe washi tape for the banner, which is carefully pieced from two strips of washi tape. I embossed the scribble circle from Doodled Designs in white embossing powder over the card base design. 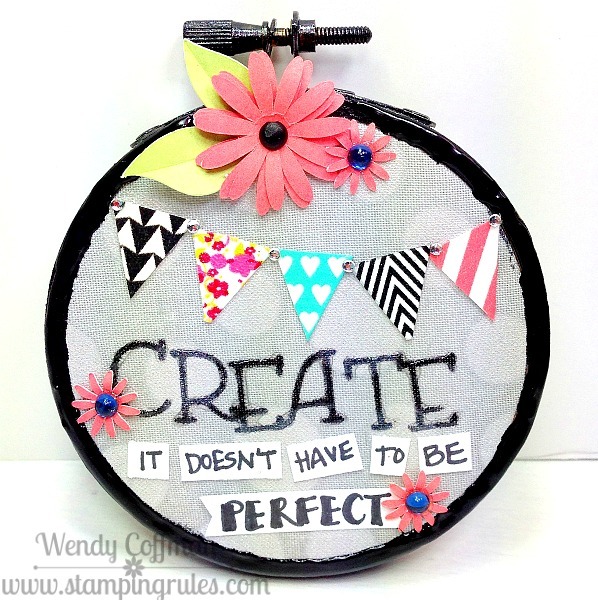 Then I stamped the circle in Glacier ink. I stamped over the circle with the chevron border in Glacier Ink and added the sentiment in White embossing powder, all from the same Have a Happy Day set. I popped the circle up with foam tape. I dug around in my Cricut diecut bin and hit paydirt with a Colonial White spiral flower that I hadn't built yet. I inked the edges of the flower in Smoothie ink, and twirled it up on my Quilling tool. After I had secured it with Liquid Glass and it was dry, I curled out the petals using my Quilling tool, then leaned on it a bit with a clean acrylic block to flatten out the flower. A smaller simple daisy shape and some leaves completed my floral spray. I'm going to link this one up to the new Paper Issues Hooray for the Red, White, and Blue challenge, as I was actually using Therm-o-Web foam squares on this project instead of my usual CTMH foam tape, because I sold all my foam tape at the show last weekend. I was so glad to find that packet of Therm-o-Web foam squares in my drawer, and I love that I didn't have to cut up the 1/4" squares. Serendipity! Tonight I wanted to get a little messy, so I got out the texture paste and headed over to Cardabilities for sketch inspiration. I added a layer of Hexagons to the white background using texture paste and an Artbooking cricut cut. Then I browsed the Internet while I waited for it to set. I loved the Just Us Girls Photo Inspiration challenge, and decided to go with butterflies instead of flowers. I stitched my hexagon textured panel to some Blossom B&T, and started gluing! I laid down a frame of nail striping tape in a shiny bronze/orange color. Then I colored my Cricut frame with a black marker, backed the hearts with more of the Blossom B&T paper, and added some nail striping tape lines to the frame. I popped that up with foam tape before adding the leaf branches and teensy flowers. I added some Wink of Stella to the butterflies and added both epoxy bubbles and bitty sparkles to the mix. 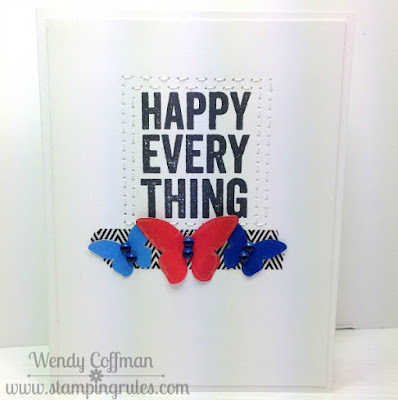 I stamped a sentiment from Happy a Happy Day and mounted it with foam tape to finish off the card. Tonight I was starting a completely different project when I spied this YOU'RE INVITED Cricut cut just laying on my desk. It reminded of the new CAS(E) This Sketch Challenge and suddenly I was off on a tangent. A glittery, gold tangent! I knew I didn't want to cover it all in Stickles, because to cover such a large area it'd be a lot of stickles and probably two coats with touch-ups. No time for that...so I went old school. 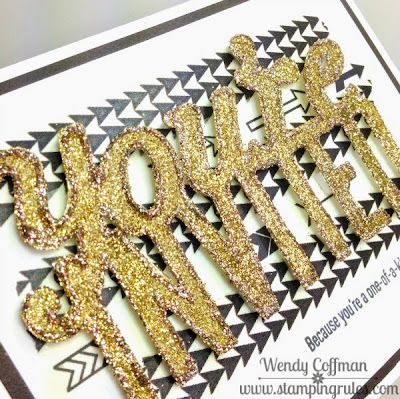 I got out my Bonding Memories 2 way glue pen and colored that die cut bit by bit, adding super fine gold glitter as I went, Then I popped the glittery diecut up over my washi tape background...and went around the edges with a slightly darker shade of Stickles. 'Cause nothing sets off glitter like more glitter, am I right? Now I can go to bed happy...covered with glitter, but happy. 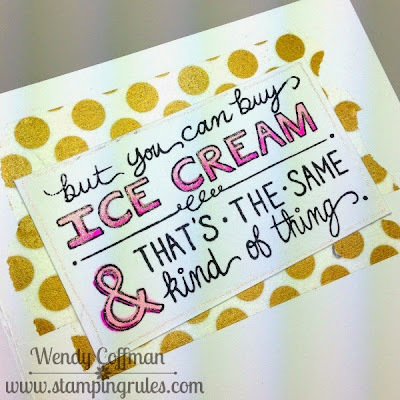 G'night, Stampin' Friends! Today I was looking at the Cricut cuts hanging out in my bin, leftovers from when I built the Cricut boards for the Heirloom Pro Show. 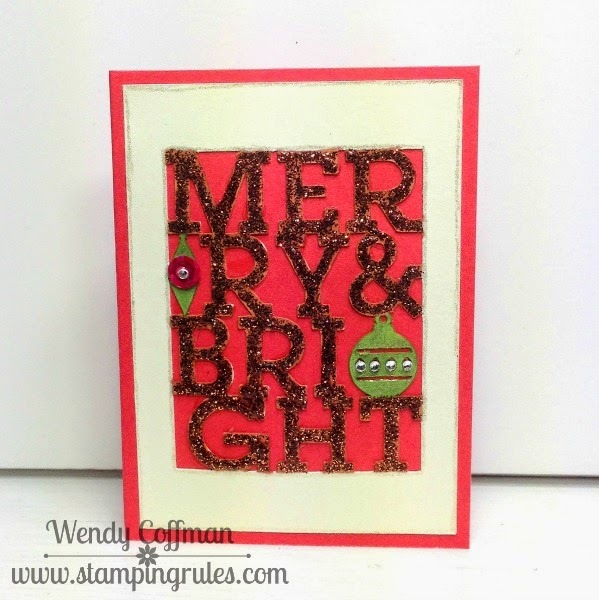 I love this Merry and Bright overlay! I mounted the overlay on bright red cardstock, inspired by the Muse Christmas Visions Challenge. I glittered the words with Cinnamon Stickles. Then I colored the ornaments with a green marker. I popped on a sequin and some bitty sparkles, then I outlined the edges with my stardust glitter gelly roll pen. Today I spent the day with Max, hanging out with his PreK class at the park and then at a class BBQ. We brought these tasty cuppies, which are gluten free and dairy free. I adapted a few recipes to get to this cupcake, and I've linked those recipes belowin my adaption. I don't always bake dairy free, but I wanted every preK friend to be able to eat the dessert tonight. I've filled these with Dandies allergy friendly marshmallows in the past, but today I just piped a bit of extra frosting inside. I did not make these as tall as the high hat recipe I cited below, because no preschooler needs that much frosting. These came out fudgy and delicious - Enjoy! Preheat oven to 350. 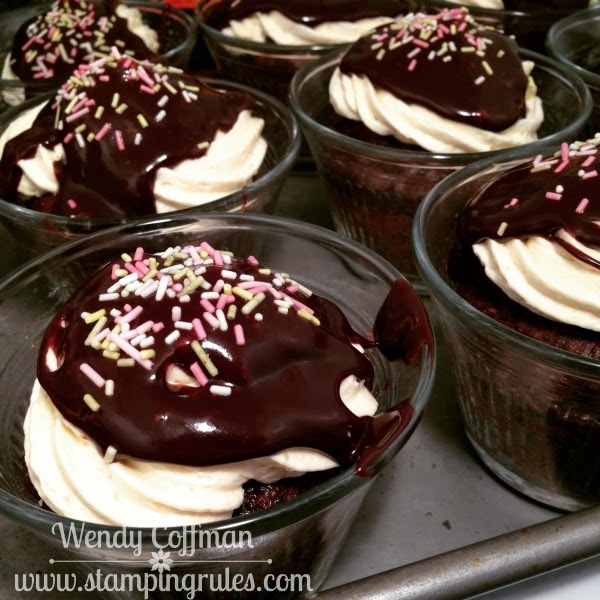 Grease 24 cupcake cups or line with paper liners. Mix dry ingredients in a bowl. Add wet ingredients and blend until thick and smooth. Scoop evenly into the prepared cupcake liners. Bake for 20-22 minutes or until a toothpick comes out clean. Allow to cool completely - then if you want to fill them, scoop out a small chunk of the center to make room for the filling. When the cuppies are totally cool, pipe on the frosting. Pop those in the fridge for a few minutes to make sure the frosting is set. Add a spoonful of the ganache on top of the frosting, and top with your favorite allergy friendly sprinkle if desired. I stored them in the fridge until party time, and they held up well unrefrigerated at the party. I took all the scooped centers and pressed them into a glass pan, I covered them with a thin layer of leftover frosting and poured the remainder of the ganache over the top. Start with 2 cups of sugar, and add the rest of the ingredients. Beat the frosting until it's your desired stiffness, adding more sugar if necessary. It will hold it's shape better when refrigerated. Place ingredients in a glass bowl. Place bowl on top of a medium saucepan of boiling water and stir until smooth. I've been percolating an idea for the Mojo Monday sketch for a few days now, but I didn't have time to make it until tonight. It came out just like I pictured it in my mind! 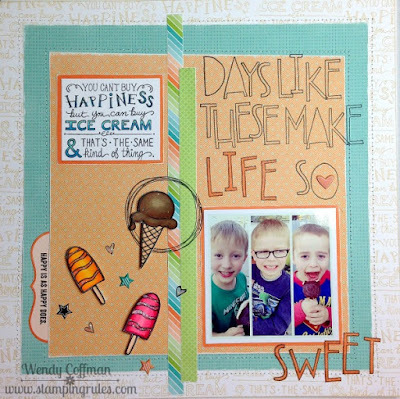 I used the Blossom papers and the Have a Happy Day stamps, still a favorite after stamping with them almost a year now. 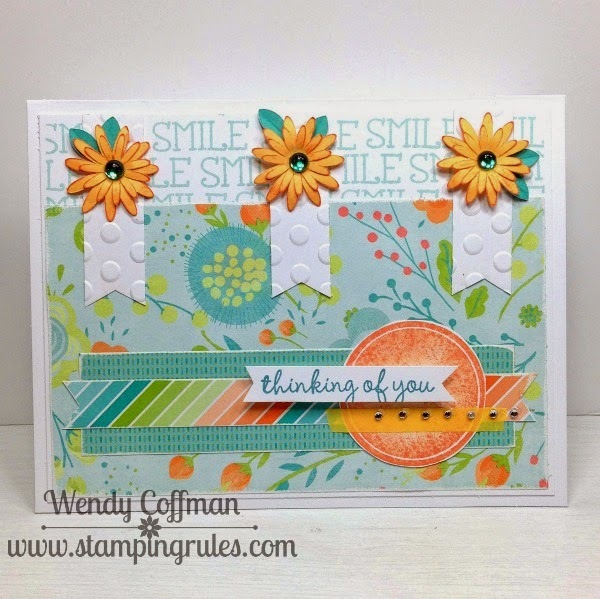 I sanded the edges of all the patterned papers, and used post-its to mask off that little white edge when I was stamping the SMILE sentiment across the top repeatedly. 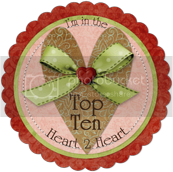 I'm linking this up to the Heart 2 Hearts Extra! Extra! Challenge. For my solid circle image I inked it in Sunset ink, then stamped it off and rolled the edges back into the ink for a textured look. I added a little banner with my sentiment and some skinny yellow washi topped with Bitty Sparkles. 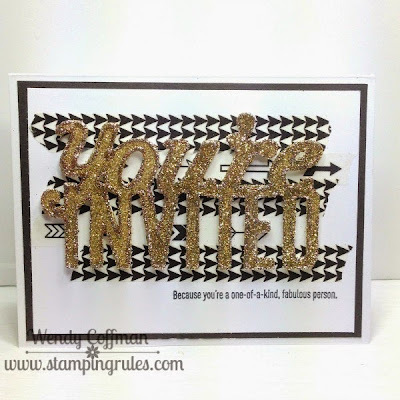 I'm going to link this to the Paper Issues Let's Get This Party Started Linky for my mad stampin' skills. 'Cause that 1/16" post-it masking was crazy fun! I didn't have a lot of stamping time today, so I used the new Freshly Made Sketches #187 as a shortcut to a cute card fast. This week's Friday Mashup Challenge was to make a card for a celebration using orange, navy, and teal. Check and check! I thought that this Artbooking Cricut cut was perfect for my niece, since she's a bit sassy herself. I colored each piece with Shin Han markers for an ombre fade. I painted the back with some Clear Wink of Stella, then I mounted the top layer with foam tape. I used this tutorial and a fork to create the mini tassel for the "hat". I added the metallic stripes in the background using nail striping tape, which is fast becoming one of my favorite things! 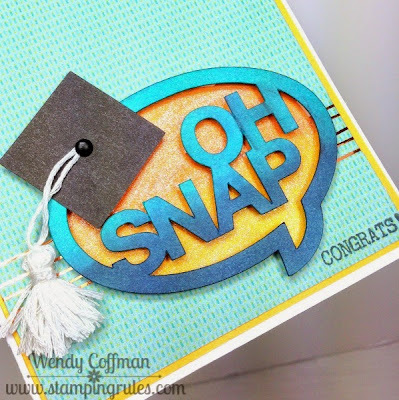 I'm linking this grad card up to the Paper Issues Let's Get This Party Started linky. tomorrow...right...tomorrow. Or soon anyways, I'm sure, right, sis? So I'm home from the Heirloom Pro show, and the first day back my littlest guy got sick. Tonight my middle guy just got sick, so I'm rushing this blog post a bit. Before my middle guy went down I did manage to whip up a fun June SOTM version of the new RetroSketches sketch card I'm planning to send in for Karen Morris's monthly swap. 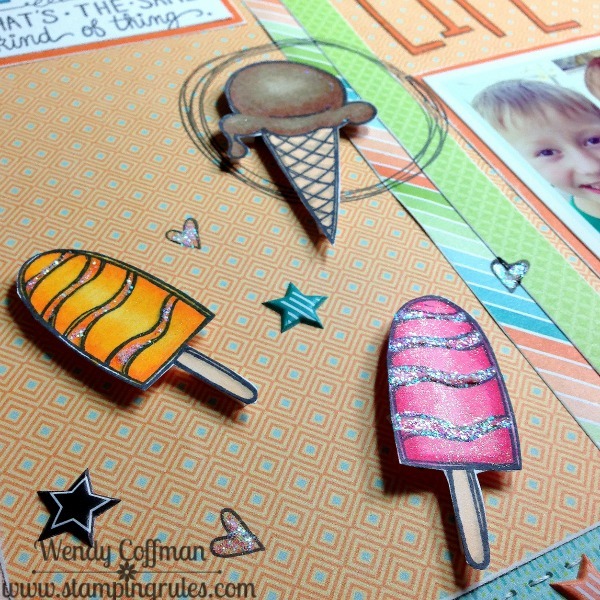 I used the Taste of Summer papers with some Chocolate and Colonial White cardstock. I stamped the images in Memento Tuxedo Black before coloring with my Shin Han markers. I used the wide end of my Shin Han Cherry Pink marker to add the "strawberries" to the ice cream. I meant for the sentiment to read "Berry HAPPY", but I'm not sure if it does. I'm needed elsewhere, so I'm going to be berry happy with my Red glitter gems and call it a night. Keeping my fingers crossed that tomorrow will be a better day! While I was working on those boards I produced quite a few Cricut cuts for items I just couldn't fit onto the boards. 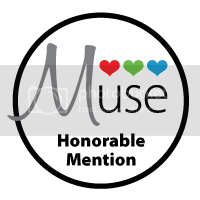 With 700 awesome cuts on each CTMH Cricut cartridge, it was hard to choose what to feature and what to leave off. I had this cute owl leftover when I finished my Artiste Board. I had cut him too big for my board, and also too large for a standard A2 card, so hes on a 5x7 card. Which, if you know me, you know I rarely make a 5x7 card, but he was just too cute to relegate to the odds and ends bin. I paired him with a sunshine I made by embossing a medallion with the chevron embossing folder. 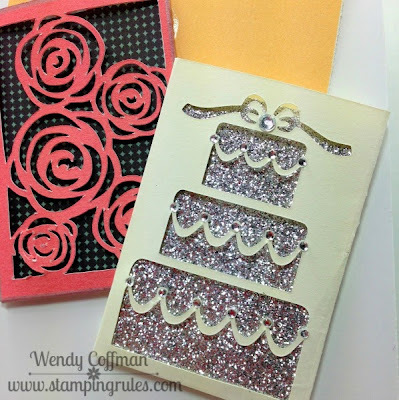 I filled the embossed lines with glitter gel, and added a sweet sentiment from a long retired stamp set. Normally I'm a big fan of googly eyes on owls, but I just couldn't get them to look right on this guy. I think maybe I needed bigger ones than I normally keep in my stash. I added these black sparkle gems instead. I stamped his wings with Smoothie ink. His feathers are Canary cardstock, Smoothie stripe washi tape, and some black chevron tape I got from this cute Etsy store, SpiegelMom Scraps. 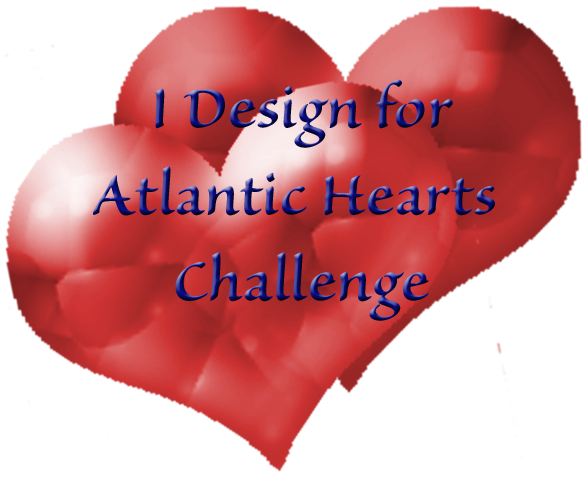 I used this week's card sketch from Atlantic Hearts Sketch Challenge. The challenge is open now, so hop on over and join the party! Today is the last day to come visit us at the Heirloom Pro Stamp show in Puyallup. And this is the last of my four Cricut boards, featuring the newest CTMH cartridge, Artfully Sent. 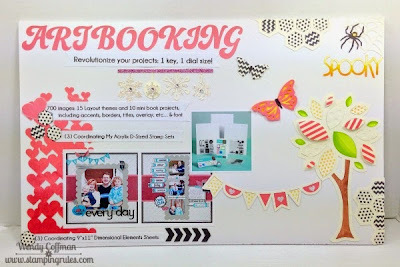 Just as Artbooking was slanted towards scrapbooking, Artfully Sent is abundant in card making projects. Of course, I tend to use whatever I want on any project I want, so I think the hardest challenge for me in making these boards was sticking to one cartridge! While Artfully sent has literally hundreds of projects to choose from, I think one of my favorites are the tiny card pockets. 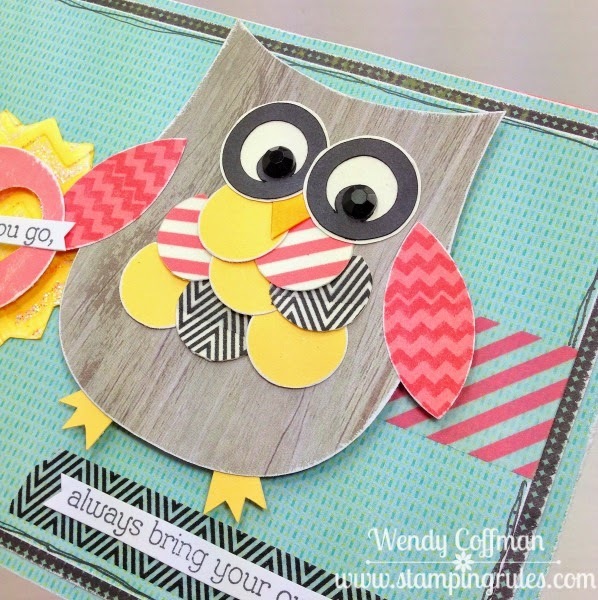 They are adorable, and perfect for cards or pocket scrapbooking. 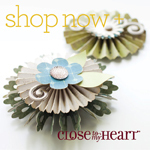 I made these in minutes - just cut, fold, glue, and pop some paper inside! I had to add some bling too, but even still the pockets come together so quickly! I'll be driving home across the state of Washington this evening after the show. I'll share some pics of the actual booth later this week, after I get my fill of little boy snuggles and family time. Hope to see you in Puyallup today! Good morning! I am looking forward to a fun and busy day at the Heirloom Pro stamp show in Puyallup today. Here's the third of my four Cricut boards that I made for the show. Artbooking is slanted towards scrapbookers and mini album makers, so it's very dear to me. It was harder for me to size down the elements intended to be for a 12x12 page for this board project, because I wanted to include so many things! That hexagon grid is one of my all time favorite Cricut cuts. This tree is definitely a favorite, too. It comes as both a page overlay and an accent. 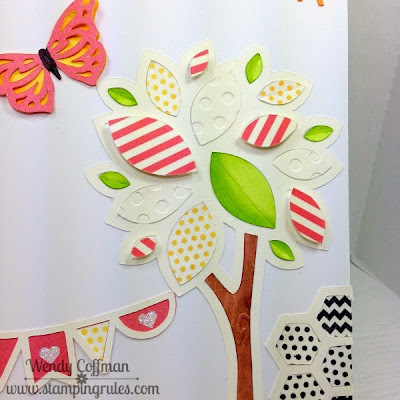 I filled the leaves in with washi tape, stamping, Shin Han markers, and embossing. It was so much fun to make, and so simple with just one button to push! I hope you'll come by to visit if you're in the Puyallup area this weekend! Right now as you are reading this I'm busy with my team of fabulous ladies building the CTMH booth for Heirloom Pro tomorrow. Here's the second of my Cricut boards we are using for signage in the booth. Artiste has an entirely different flavor than Art Philosophy. While I love the simple shapes of Art Philosophy for scrapping and building my own garden, I love the 3-D images of Artiste. There's so many cool projects I had a lot of trouble choosing what to put on this board. I had to bring in the cuppie, which I detailed with some freehand embossing, Shin Han Markers, and lots of glitter and gems. I also made a sparkly sunshine out of a flower and a button image. I love the different shapes of the rolled flowers on this cartridge. I also love that the 3-D elements are even incorporated into cards on this cartridge. Hello! How cute is that? 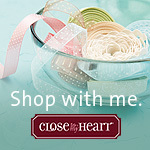 Tomorrow is the first day to visit us over at Heirloom Pro in Puyallup - hope to see you soon!